Helping this patron after she asked the question was straight-forward, but the question itself was kind of interesting (for three reasons). Patron: I need help with my Netflix account. Me: Sure, what's the problem? Patron: Well, I have WebTV at home, and I just signed up for a Netflix account. It worked far enough to allow me to input my credit card number and purchase the account, but it stopped working when I got to the part were I set up my request list. I called their tech support, and they said that yes, the WebTV browser will not work with this part of the Netflix website, and that I should go to my public library. So here I am. The patron and I went over to one of the public computers, logged into her account, and selected a few movies for her to start with. She figured it out pretty quickly, and should be able to do it on her own the next time she comes in. *Earlier this week I read a Public Libraries article by David Lee King and Michael Porter entitled, "You as Internet Know-It-All". Basically, it explains why it is important for librarians to (at the very least) be familiar with emerging technology and what's popular, regardless of whether or not we use (or even care about) them ourselves. I liked the article, but the reference question above nicely illustrates the importance of their point: this patron would not have been served well by a librarian who wasn't comfortable with websites, at least somewhat familiar with Netflix**, and willing to explore something new. This is who our patrons are, and we need to be ready for them. **And for the record, I don't use Netflix myself. I mean, come on; I work in a public library... every movie I'd ever want to see, and no little red envelopes. 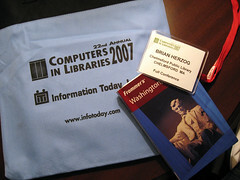 A coworker of mine and I are in Washington, DC, this week for the Computers in Libraries 2007 conference. So far, I’ve been to just three sessions (and some sightseeing), and it’s already worth the trip. Next was David Lee King's Monday morning session on planning and implementing Library 2.0 projects. This was a quick session on why and how libraries can use Library 2.0 tools, and what absolutely must be kept in mind – planning. He covered blogs, wikis and flickr in very general terms, focusing mostly on why proper planning is important, and what could happen when projects are launched without planning. Basically, a lot of effort is wasted, not to mention an opportunity to communicate with patrons. Then it was on to Jessamyn. I love her. Her pre-lunch talk was on how to sup-up your Firefox browser. She shows a bunch of plug-ins, extensions, and skins, and, in her own way, convinced a crowd of hundreds why Firefox should be on every library's public computers. I only hope they take her advice, and that I can convince my library of this. She also spent a lot of time on greasemonkey, a Firefox extension that allows you to run little scripts to modify webpages. I've played a bit with greasemonkey in the past, but it was great to see what someone else does with it. Now I've got some ideas, and that's when I'm at my most dangerous. The schedule for Tuesday looks like it'll be a little more filled out. Plus, the exhibit floor will be open all day, so I can talk to some vendors, too. And then in the evening, I'm meeting up with my cousin Elizabeth, who recently relocated to the DC area after finishing her MBA. So all in all, it should be a good day.